In yesterday's post I mentioned spending my Friday night at my friend Jeff's shop. At some point during the night the conversation turned to cars we remember our parents having when we were growing up. If this had been a contest, Jeff's dad would have won the award for "coolest" cars owned, having owned (among others) a Jaguar XJ6 Coupe, several Lancias and a BMW 6 Series (all bought brand new). My dad, having worked for GM, would have won the "sheer quantity" award as he was given a new car to drive every few months. It's tough for me to remember all the cars my father had, but one that sticks out in my mind was the Opel Manta Rallye he had in the early seventies. If you've been reading this blog for awhile you know that I believe GM made a huge mistake when they stopped importing Opels. Had they not, they may have had a real line of cars to compete with BMW and Audi. They most certainly would have had a line of cars to compete with Volkswagen. In the early 1970s, Ford's new Capri was selling like crazy in Europe. Opel's new styling chief, Chuck Jordan, designed the Manta to compete with it. He succeeded. As someone once wrote, "if BMW had wanted a $3000 dollar coupe, the Manta is what they would have created." Opels were sold through Buick dealerships. That gave them a large dealer network, but it wasn't the place most people thought of when looking for a sporty European car. Still, for a number of years Opel was the second best selling import car in the US, behind Volkswagen. But, GM wasn't convinced that US car buyers wanted to pay top dollar for German imports and stopped importing the car after 1975. For two years (1976 & 1977) they sold a dreadful Isuzu under the name "Buick / Opel by Isuzu". That car all but killed the Opel name in the US. The Opel Manta being offered on eBay needs restoration, but it's complete and with the exception of some surface rust, rust free. Opels are durable cars and with the exception of the carburetor (Don't even think about rebuilding it, just replace it with a Weber) have no glaring faults. Parts are not easy to find these days, but there are several clubs and specialty shops that should be able to help you out. My first car was an Opel Kadett. My first "sports car" was an Opel GT. I'd love to own a Manta someday. It has a lot of the sportiness of the GT, but in a body that's almost as practical as the Kadett (and a whole lot better looking). Click here to see the eBay listing for this Opel Manta. Click here to find the Opel Motorsports Club website. Although their website hasn't been updated since 2004, I believe Opels Unlimited is still in business. Click here to see the website. Another car I would love to own, not many around now. The styling for me looks lovely, imho, the best looking Opel ever made. The series B Manta, after 75 I think, was ugly and the 80's version does nothing for me at all (although to be fair, has a huge cult following in Europe). Cheap to run, cheap to buy, good looking practical classic, seems like a great deal! One of my favorites too. In fact, I had three of them. Not real hi-tech underneath, they had a torque-tube rearend, but they all came with good disc brakes up front and the cam-in-head 1.9 engine was pretty durable. (I did have one with a bent crank, though.) Sturdy 4-speed transmissions, but the automatics that I had all included flexplate bolts that would work loose. Cavernous trunk for a small car. I also had the Kaddette ( a '69 Rallye Edition) and a '72 GT in "FireGlow" orange. The last Opel I had was a 75 Ascona with the somewhat finicky fuel injection. Always wanted a wagon, but the good ones never get let go. brand new off of the show room floor. Mine had a 3 speed automatic with the shifter on the floor. It wasn't the fastest off of the line, but it had a top end of over 130 mph. I regret to this day that I traded that car in. Owned a number of Opels, including Mantas, over the years. The Manta had the best handling out of the box and was tossable like a BMW 2002 and the Honda CRx. Currently restoring one with all of the European options including the GT/E packaging. Upgrades include a modern Opel 2.0L DOHC 16v and 5-Spd. 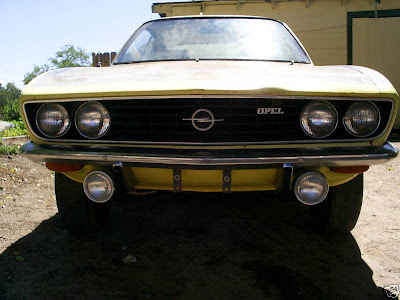 My first Opel was a 1972 Rallye in Rallye Gold and the flat black hood. I drove that one hard for seven year but I couldn't kill it. Hop in and I will take ya for a ride. 104 MPH into a 90 degree right turn. Slap it into second gear and pop the clutch. The engine's compression locks up the rear end and the tires are sliding. Give the wheel a quick turn to the right and the rear end starts to come around. Slap it back into third gear and you are around that corner still doing 88 MPH. A quick shift back into fourth gear and your nerves and settling down as you realise you are still alive. That is how I drove that car. During that turn the tach needle slams into the peg around 9200 and the way it hits I know that engine was turning way over ten grand. Not too shabby for an engine that red lines at 7200. I did put at least one new water pump on the engine per year because the bushings in the pump couldn't handle that much RPM. Totally I had 23 Opels and I sold parts to a lot of folks. In 1971 (As a young 21 ye old student working 40 hours a week and going to college) I invested some scarce funds for a brand new Opel Rallye 2-door. It was dark orange with a flat-black hood and cool striping. The 4-speed transmission was great as was the rack & pinion steering; tight and controllable! The only reason I traded it in was marriage & kids. If only I could go back, I'd have kept the ride forever... (But I still have the same wife, so I'm still ahead.